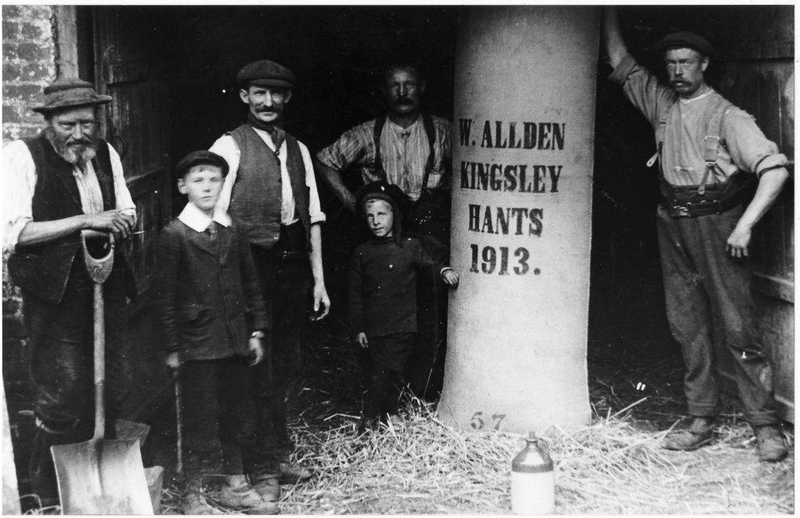 Joseph Allden was born in Headley on 31 July 1889 at Stream Farm where his father, William, farmed. 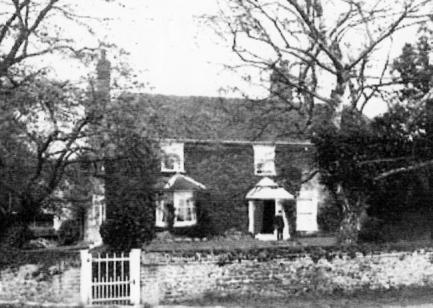 By 1907 he had moved with his family to Malthouse Farm, Kingsley. Malthouse was a large mixed farm, with a substantial farm house. It was known for its hops and would have employed many farm workers, with Joseph and his younger brother Samuel shown as "helping on farm" in the 1911 census. (This younger brother, Sam, carried on farming at Malthouse until 1935 and had Monkswood built at that time).In late 1915 Joseph joined the Oxfordshire & Buckinghamshire Light Infantry (The 24th Battalion)as a 2nd Lieutenant. His 22 year old younger brother, Samuel, appears to have enlisted before him, by November 1914 in the 2nd Batt. Public School Company - leaving none of William and Elizabeth’s five sons on the farm. William, his wife Elizabeth and his daughter Ethel were very involved in village life during the war years. William was a School Manager and on the PCC. Strangely, though he and the Vicar, the Rev. Mason, BOTH lost their sons in 1917, no mention of this is made in the Minutes at that time. 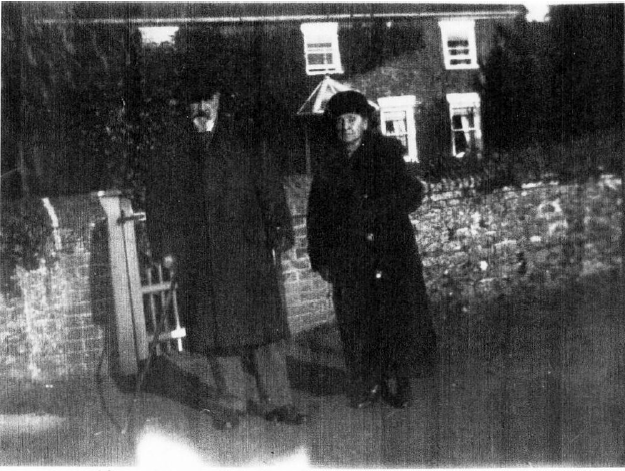 William, his wife Elizabeth and his daughter Ethel were very much involved in village life during the war years. William was a School Manager and on the PCC. Strangely, though he and the vicar, the Rev. Mason BOTH lost their sons in 1917, no mention is made of this in the Minutes at that time. Elizabeth Allden was very active in war work – for example she was director of a working party that made and sent mufflers, socks etc. to the troops. She and her daughter were also involved with many of the activities at All Saints and Ethel was the Kingsley Guides’ leader. I could find nothing about Joseph during 1916 but by early 1917 he is described by his commanding officer as "A new officer, Allden, in my company, also proved his worth about this time." Joseph was involved in a raid named "Raid Fayet" near St Quentin on 28 April 1917. No. 13 Platoon, was led by Lt. Allden and his Sergeant, Kilby, both of whom were killed during fierce fire from the German machine guns -although the raid was hailed as a success, with two machine guns and one protesting prisoner being dragged back to the lines ! 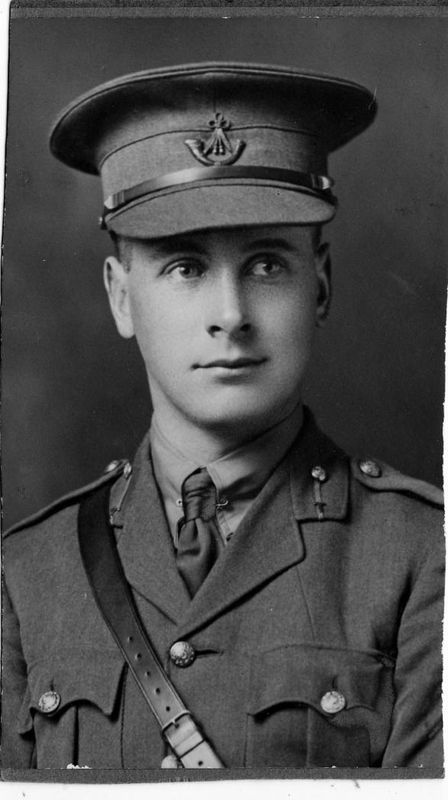 Joseph’s Commanding Officer wrote in his memoirs "Allden and Kirby were a serious loss to the fighting efficiency of D Company." "A young man in the prime of his life taken, with many another, fighting for freedom and truth, buried amid the booming of guns in a foreign soil." At Morning Prayer on 6 May a special hymn and the "Dead March" were added to the service. The Vicar commented "He made his Christmas Communion at this church . His life and character were calculated to commend the doctrine of God in our Saviour to those who knew him. The King and Queen’s telegram of condolence is much valued by the family." Joseph Allden is remembered on the Thiepval Memorial and on a brass plaque in All Saints. 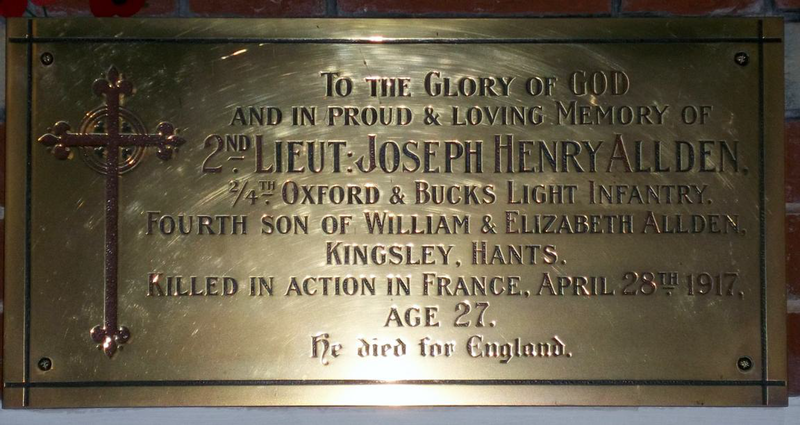 He is also named on the Headley War Memorial. His family lived on at Malthouse until 1935, purchasing the farm from the Dutton estate for £8,500 in 1920. William Allden died in 1927 and his wife, Elizabeth in 1930 and are buried in Headley churchyard.